Have you heard of Rockets of Awesome? This new children's clothing service (specializing in sizes 2-14) offers high-quality, on-trend items that make shopping for the girls SO much easier and less hectic than dragging them to a store (where the excitement lasts about 3 minutes). HOW IT WORKS: after creating a style profile on the site, Rockets of Awesome will deliver 8-12 seasonally-appropriate items based on your child's preferences 4 times a year. With zero membership or shipping fees, you're only charged for the items you decide to keep. Return the things you don't with a pre-paid shipping label & envelope. Everything you'll receive is $40 or under, and all items are easy to mix & match together (that gets a big THUMBS UP from mama). 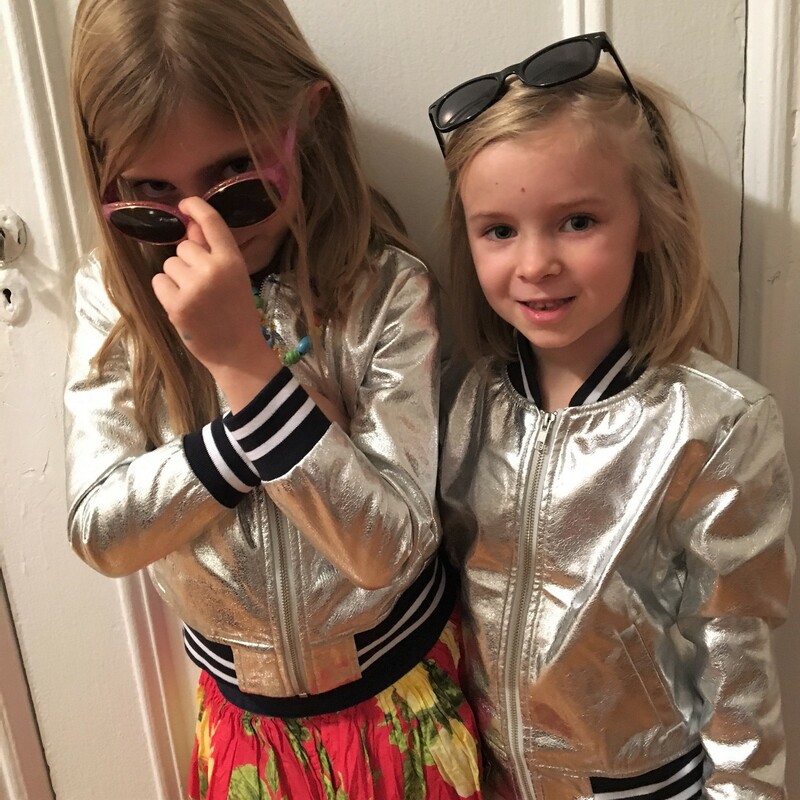 The girls were sent a box to try out a couple months ago, and they've had so much fun wearing these styles. Meanwhile, I've been impressed with the quality, comfort and variety of clothing that arrived (from casual to dressy and sporty). Of everything we received, I probably would only have sent back 2 or 3 items, so they really seem to have a good sense of the styles the girls like from their profile. I'm all about simplifying our lives these days, and this is an easy way for us to make clothing decisions. Plus, it's kind of fun to have the fashion show when the box arrives! Viv has never been afraid of color: she loves this bright orange skirt! Rockets of Awesome signature silver jackets - so cool! This is only a small sampling of what arrived, so I encourage you to check out Rockets of Awesome and see their durable and creative styles for yourself. So much fun! Disclosure: I was provided with product in exchange for an honest review. All opinions herein of my own.